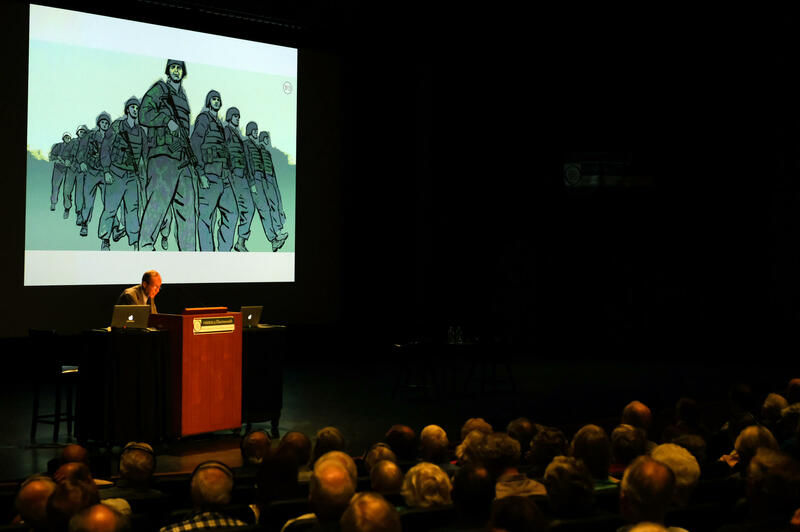 Former Defense Secretary William Perry ended his remarks at Dartmouth by playing two animated videos that depict scenarios where nuclear weapons are used, ending in catastrophe. Former U.S. Secretary of Defense William Perry delivered a sobering talk in Hanover Thursday, focusing on the potential for nuclear devastation in today's global environment. His lecture, part of the Osher Lifelong Learning Institute at Dartmouth's summer lecture series, was largely an attempt at a wake up call. "I believe that today, the likelihood of a nuclear catastrophe is greater than it was during the cold war," he said. "And yet, we here in the room today are blissfully unaware of that." On North Korea, he warned against a preemptive strike by the U.S., arguing instead for continued diplomatic efforts with China. "There is a path forward on diplomacy, but it's a very difficult path," he said, "and it's not clear that we are in a mood to follow that path." He also told stories from his career of moments where intelligence was either lacking or wrong, reflecting that, in tense situations, much depends on the temperament of the president. The lecture was part of his ongoing attempts to raise awareness around what he sees as a dire nuclear threat. He closed by playing two animated videos he's created that depict hypothetical scenarios that end in nuclear catastrophe in both the Middle East and U.S. He said he realized the limits of lectures and books when it comes to educating the public, and hopes online videos will be effective in reaching more people.